Conn-Man Games: You wanna piece o' me?! You wanna piece o' me?! Jon Mark (Mr. Pendleton), Terry (Captain Beefheart), Ken (Mr. Stephens), Bill (Mr. Harrison), Tommy (Isabella) and Tim (the natives). Dawn faintly lit the otherwise peaceful horizon. 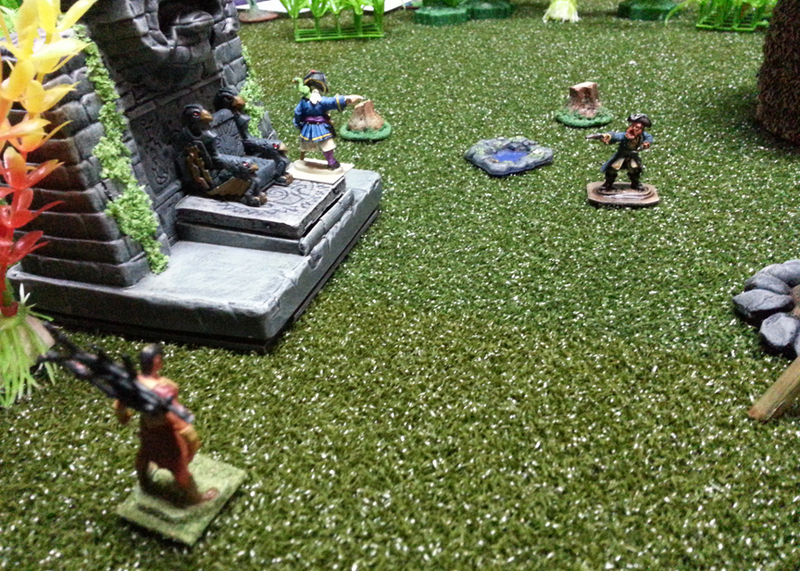 The peace of the moment was suddenly broken by the Bosun's loud bellow of "Where's the Cap'n?!" "Where's Isabella?" chimed in Mr. Pendleton. "She's supposed to have watch duty this mornin'!" "Where's Mr.Stevens?" puzzled Mr. Harrison. "He said to bring my money 'cuz he'd teach me how to play knucklebones this morn." The cry went up aboard The Skidmark as the search for their missing crew mates (and Captain) continued. They were simply gone...vanished from their berths. The captain's cabin looked like there had been some sort of altercation, but nobody had seen or heard anything during the night. Now, with the night's watch ready to be flogged for falling asleep at their posts and the rest of the crew warily eyeing the Royal Marines for signs of mutiny, the faint sound of drums can be heard from the island. 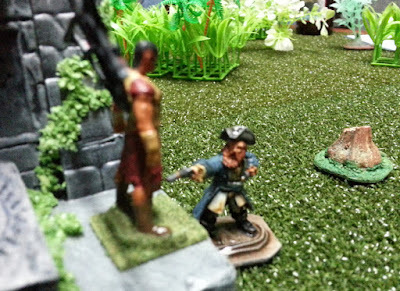 The captain, Isabella and Stephens were indeed spirited away from The Skidmark by natives...native cannibals! With the crew skittish and wary, the bosun stayed on board while Mr. Harrison and Mr. Pendleton ventured onto the island to see what the drums indicated. 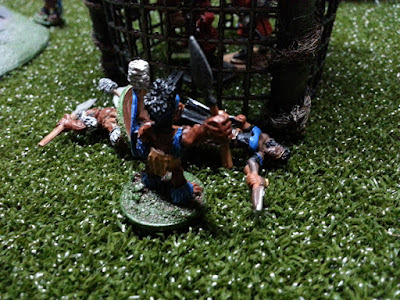 Unbeknownst to them, a small group of natives, intent on rescuing one of their own captured men, was also closing in on the cannibals. 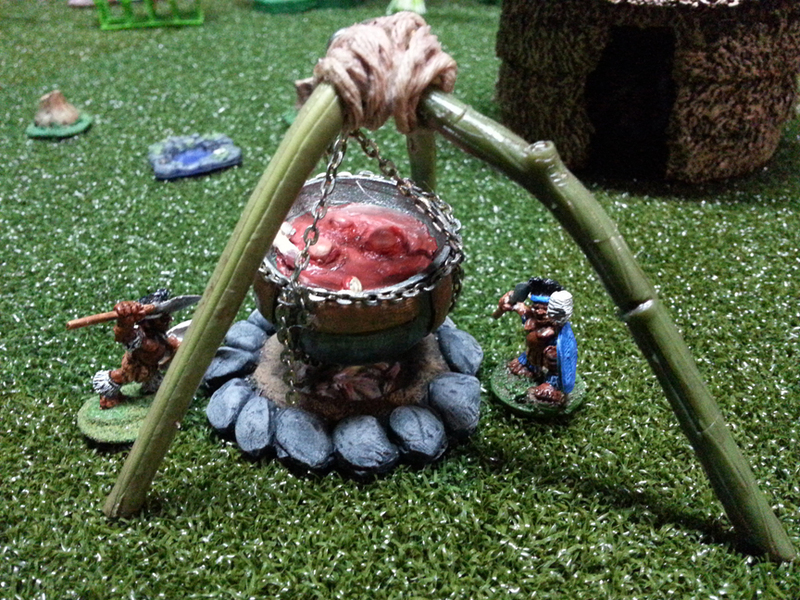 Will their combined might be able to save the captives, or will there be fresh meat in the stew tonight? 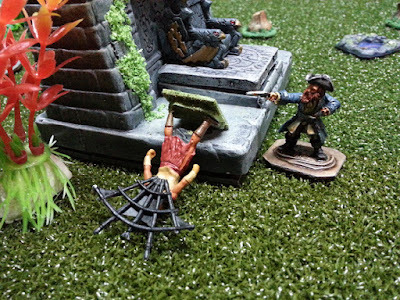 Captain Beefheart, Mr. Stephens and Isabella wake up to find themselves in a bad spot. 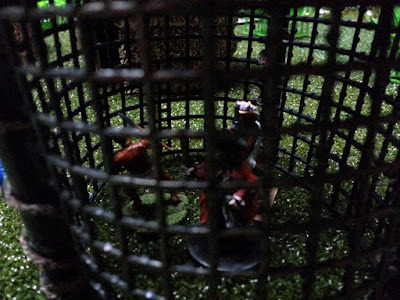 The men are locked in a large metal cage, while Isabella is lashed to a pole in the middle of a clearing. As their heads clear, they notice several things. 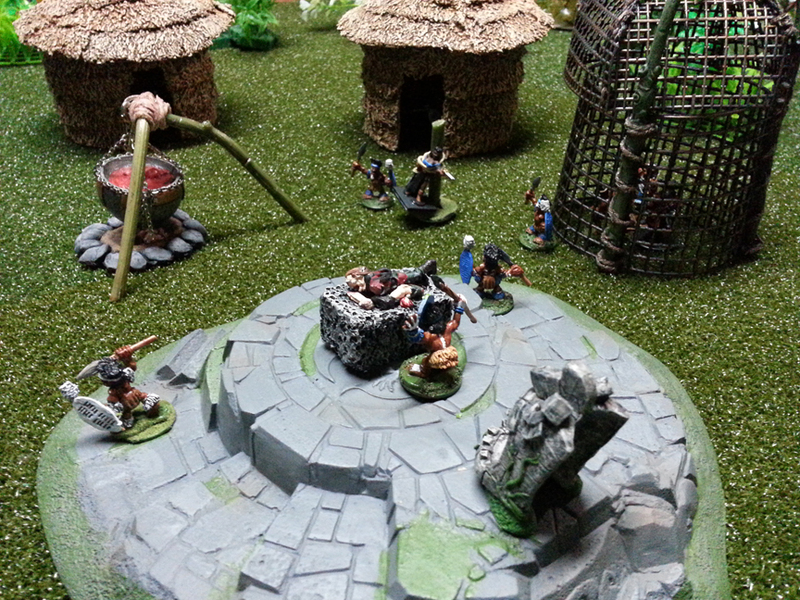 First, they are in a primitive village of some sort. 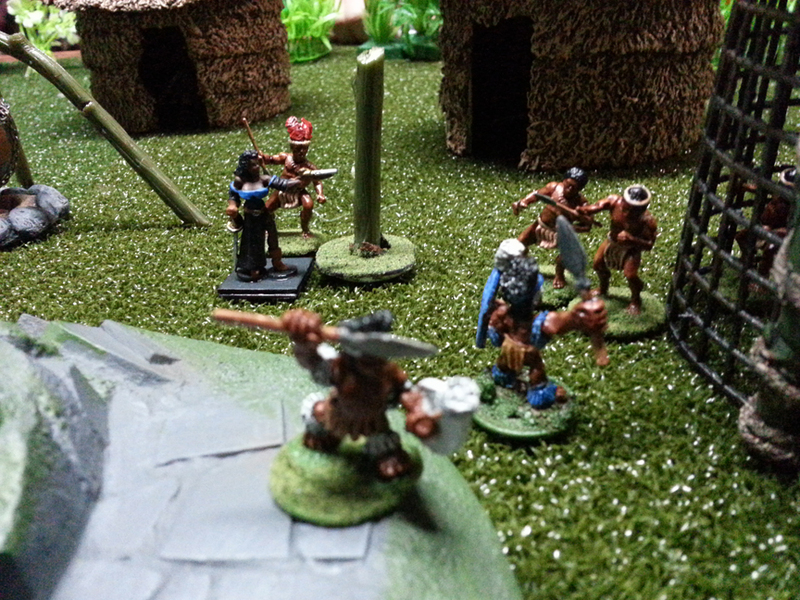 Next, the village is populated by pygmies wielding short spears...and they don't look friendly. 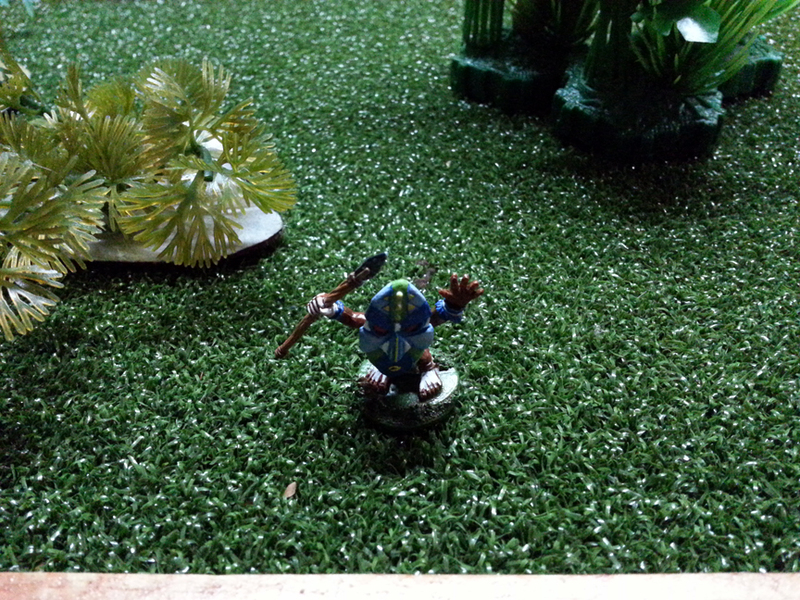 Third, there's another captive in the cage, but he's not a pygmy and he looks terrified. Also, there's a rather large native (again, not a pygmy) standing on an old statue of some forgotten god, staring at Isabella. Finally, there's a pygmy in a ceremonial mask (a Witch Doctor?) standing front of a bloody altar, complete with dissected corpse. Just as the mental mists begin to clear, the 'Chief' began talking to Isabella in island patois. He asked her where Captain Bonefist is and why she was on a different ship. 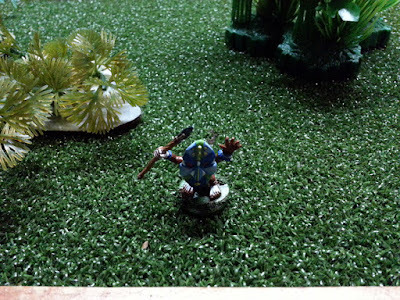 She was still too groggy to form a culpable lie and informed the Chief that she was no longer part of Bonefist's crew. 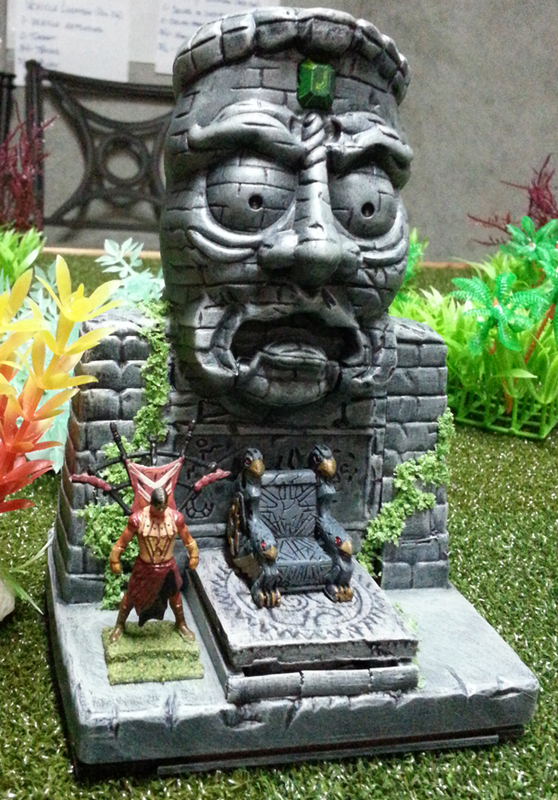 The Chief laughed maliciously and nodded to the masked pygmy to begin his ceremony. The crew watched as the Witch Doctor presented some of the pygmies with pieces of the unfortunate soul on the altar that were then thrown into the bubbling cauldron. Isabella was untied and led to the altar to suffer the same fate. She struggled mightily against her captor, making him trip and allowing her to slip her bonds! 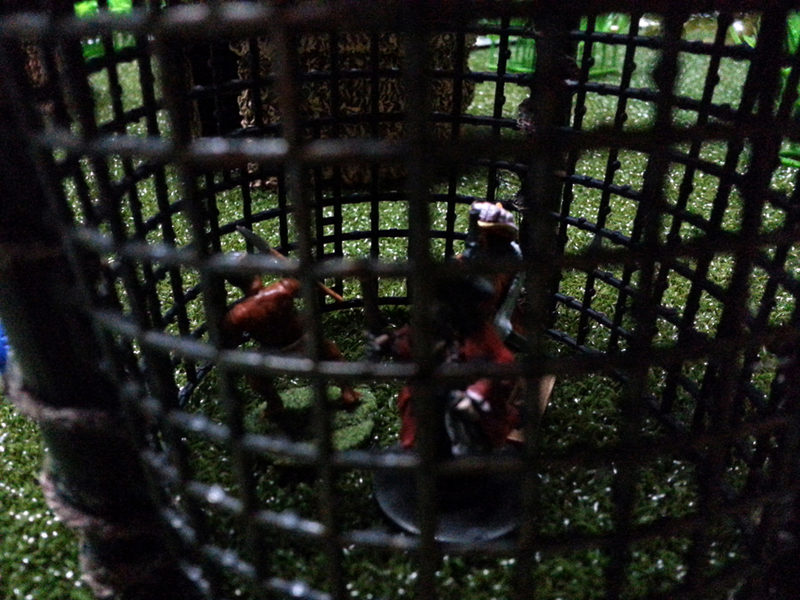 Free at last, she scrambled for a spear and dashed toward the cell. The Witch Doctor, ever vigilant and somewhat antsy, left his altar and tried repeatedly to stop Isabella with mystical incantations, but to no effect. Despite his failures, Isabella's freedom was short-lived. 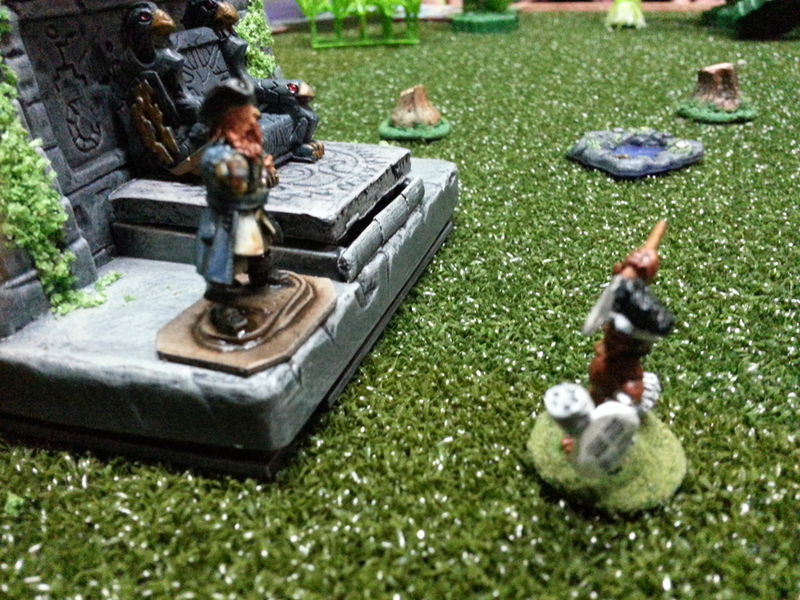 She was eventually ganged up on, knocked over, pummeled and bound again. While all this was happening, several things were afoot. First, Pendleton and Harrison had taken a circuitous route to the back of the statue and prepared to take on the Chief and his guard. Second, Beefheart and Stephens distracted their guard with various displays of...ingenuity...while Isabella tried to escape. 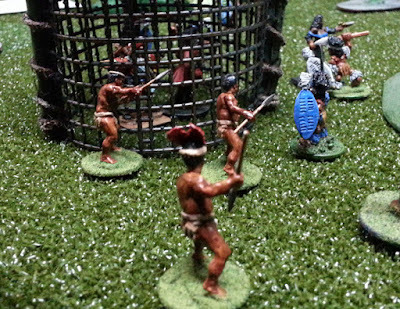 Finally, the natives finally arrived on the scene, but took a very indirect approach toward the cage and their tribesman. Events unfolded quickly after that. On the far side of the clearing, Pendleton and Harrison got into a scrum with the Chief and his guard. During this exchange, Pendleton was knocked out of action, but Harrison was able to reload fast enough to shoot both enemies. 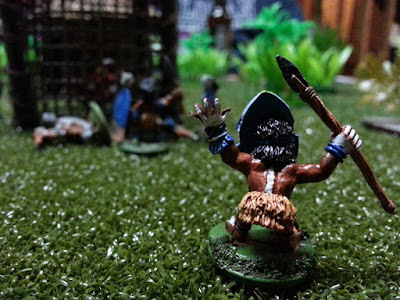 In front of the cage, Isabella was once again able to get free from her captor, snag a spear and get into the hut where the crew's stolen weapons were located. She killed the guard in the hut, grabbed everyone's gear and headed back into the fray. She began firing and advancing when she was hit from behind and almost knocked down by Timba, leader of the native 'rescuers'. Indeed, the natives had chosen that particular moment to appear from the dense jungle. 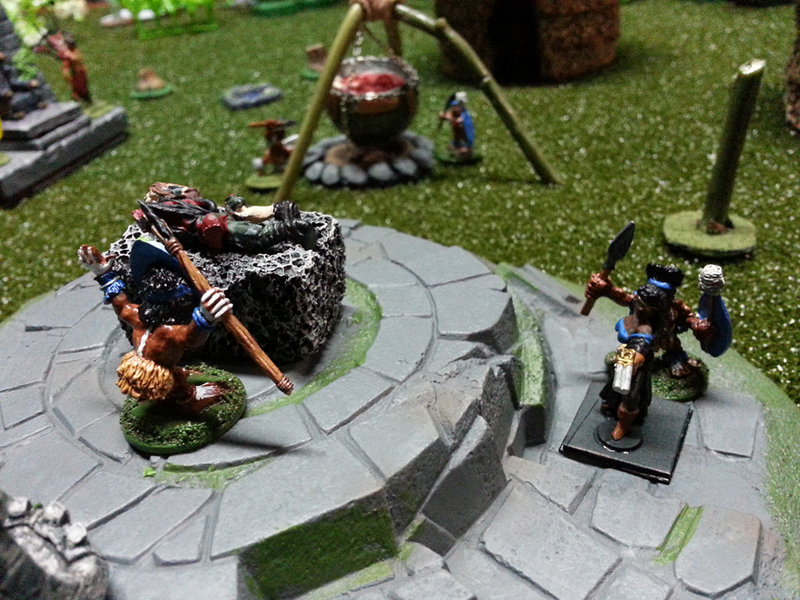 Not knowing what was going on, they attacked the pygmies. Timba was killed quickly and the rest of his men were either killed or forced to retreat in short order. Finally, when things looked like they were going against the crew, their fortunes reversed. 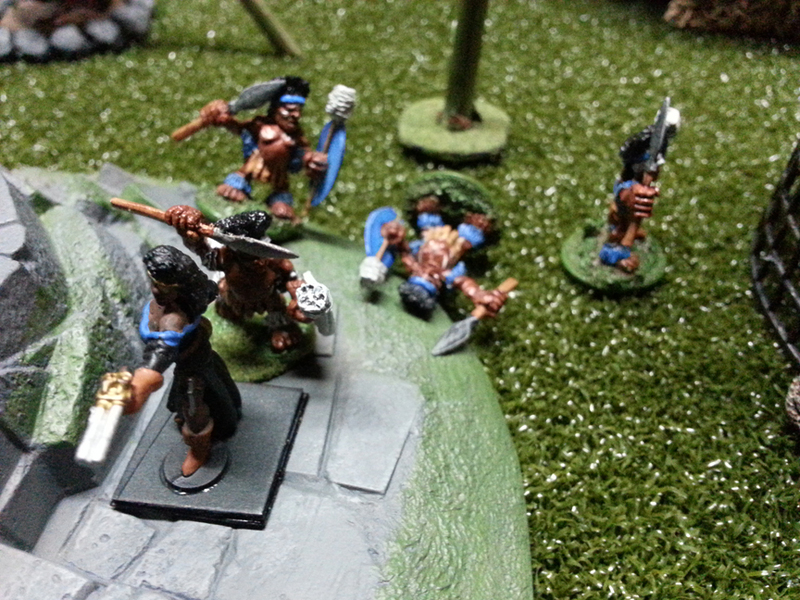 With the death of the Chief, the rest of the pygmies ran, morale temporarily broken. The Witch Doctor, perhaps afraid for his own life or more likely sensing that retreat was the correct way to stay alive, fled. 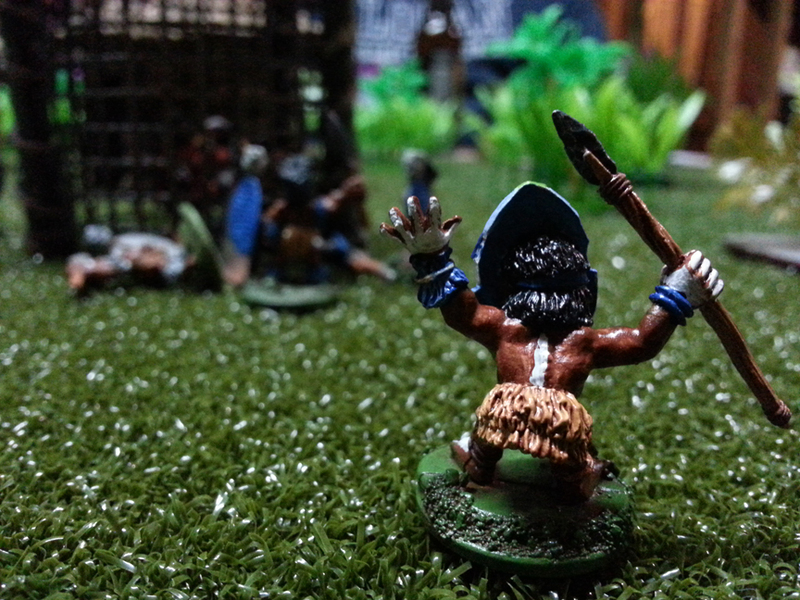 The final native, in a fit of sheer bravery, returned to the cell and freed the captives. 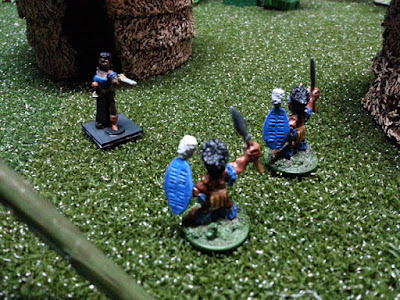 The captain and Stephens rushed to a beleaguered Isabella's side, armed themselves and commenced to waylay the remaining pygmies. A couple escaped into the jungle and the crew was reunited in victory! While not the most exciting adventure in the campaign, it was still fun. Of course, the company, crack corn and cool libations help immensely!